Home.searchfreerecipes.com is the PUP that uses misleading techniques to prevent removal. Use Reimage to locate malicious components and get rid of them faster than with uninstall instructions. A full system scan blocks virus reappearance and prevents traffic to malicious domains. 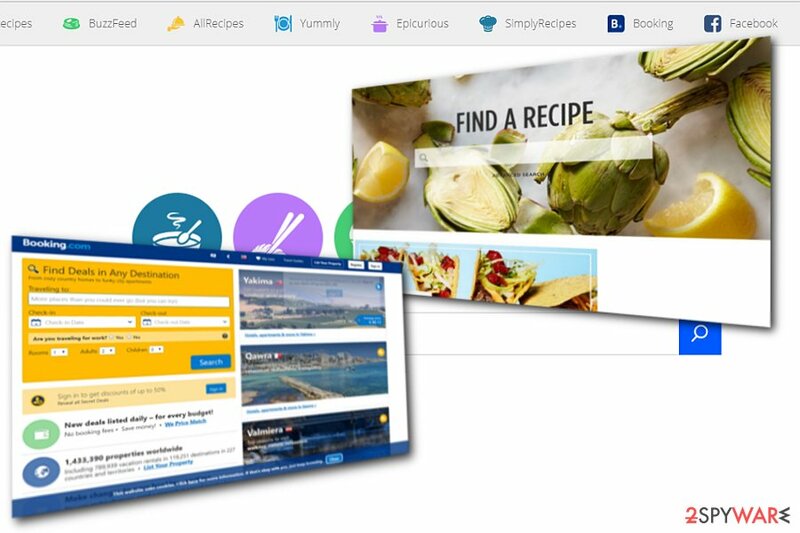 Home.searchfreerecipes.com may seem to you like a great option to connect your two interests – cooking and browsing the web. When visiting, you can clearly see links to cooking–oriented domains, Facebook, Buzzfeed and similar places. Initially, it might seem interesting. However, soon you can start noticing redirects to sponsored domains, strange ads and similar inconvenineces. Note that the latter phenomenon might eventually become a true headache during your browsing sessions. If you tend to click on intriguing headlines, such habit might lead you to the site which is infected with virtual threats. Furthermore, you may dislike the fact that the domain collects certain information about online browsing habits and shares them with third parties. Such virtual threats are typically interested in people's search terms, clicked links, ads that they find interesting, computer-related information. (IT address, location, etc.) If you value your privacy, you should initiate Search Free Recipes removal. Reimage does it for you faster. While the site may seem practical, further analysis has revealed that the hijacker belongs to a wider network of BlpSearch search tool network. Furthermore, this domain seems to have its counterpart — home.srchfreerecipes.com. It is an identical search tool presenting the same third party links. What is more, it seems that the company aims to compete with other companies’ releasing questionable PUP-like programs like Polarity technologies and Aztec Media. It seems that ElementSoft SL applies the same technique. For instance, its another product, home.searchfreehoroscope.com, which offers horoscopes as additional service to browsing. Such information is highly valued as it helps them create more relevant ads. On the other hand, excessive advertising has never been a pleasant phenomenon. However, it seems that it can also cause home.searchfreerecipes.com redirect problem which might lead you to websites containing more vulnerabilities. Home.searchfreerecipes.com is only one multiple recently released questionable tools of ElementSoft SL. Since this company seems to divert to the same distribution strategy, you may notice its search tools promoted in affiliated sites. Search Free Recipes can be found in cooking-related domains hijack is unlikely to happen as it is still rarely promoted as an add-on to freeware. However, “bundling” PUPs to free applications is a common practice among developers of unwanted applications. Note that even if carelessly installing Skype or Java might lead you to install unnecessary software. Thus, make a habit to choose “Custom” settings rather than “Basic.” Now let us discuss options to remove home.searchfreerecipes.com. This browser infection does not seem to behave aggressively. It does not urge you to install any specific software. Thus, you will be excluded of the burden to uninstall the app. Nonetheless, it is still recommended to remove SearchFreeRecipes virus elements. You can do it manually or automatically. The tool will also help you deal with more elaborate infections. You can perform manual Home.searchfreerecipes.com removal as well. Besides Internet Explorer, Chrome and Microsoft Edge, Firefox and Safari users will find the respective guides. Pay attention to every detail. Note that the site does not solely target English users, but, for instance, might appear in Bulgarian sites too. To uninstall SearchFreeRecipes from Windows, use the following guide. Make sure you remove all entries that belong to ElementSoft SL, Polarity technologies and Aztec Media. Here, look for Home.searchfreerecipes.com or any other recently installed suspicious programs. Wait until you see Applications folder and look for Home.searchfreerecipes.com or any other suspicious programs on it. Now right click on every of such entries and select Move to Trash. When in the new window, check Delete personal settings and select Reset again to complete Home.searchfreerecipes.com removal. Once these steps are finished, Home.searchfreerecipes.com should be removed from your Microsoft Edge browser. Here, select Home.searchfreerecipes.com and other questionable plugins. Click Remove to delete these entries. Now you will see Reset Firefox to its default state message with Reset Firefox button. 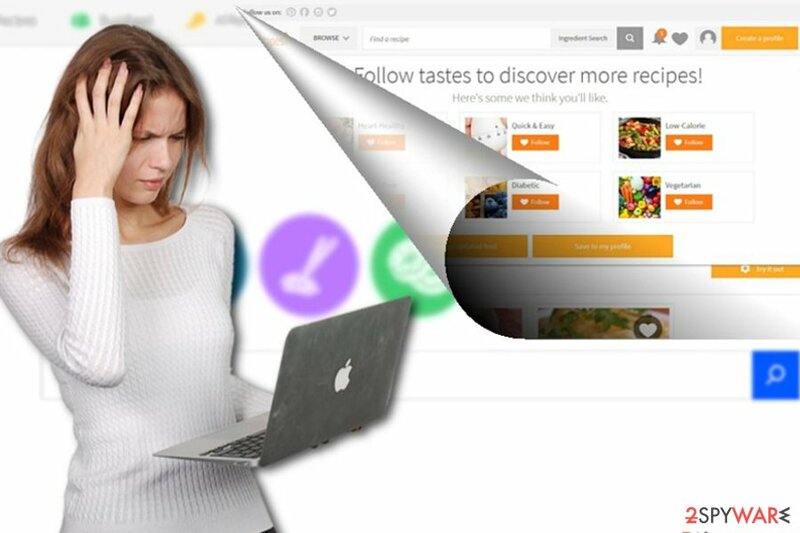 Click this button for several times and complete Home.searchfreerecipes.com removal. Here, select Home.searchfreerecipes.com and other malicious plugins and select trash icon to delete these entries. Click Reset to confirm this action and complete Home.searchfreerecipes.com removal. To fix Safari web browser, delete all Search free recipes-related components. You can also reset your web browser. Here, select Extensions and look for Home.searchfreerecipes.com or other suspicious entries. Click on the Uninstall button to get rid each of them. Here, look at the Homepage field. If it was altered by Home.searchfreerecipes.com, remove unwanted link and enter the one that you want to use for your searches. Remember to include the "http://" before typing in the address of the page. Now you will see a detailed dialog window filled with reset options. All of those options are usually checked, but you can specify which of them you want to reset. Click the Reset button to complete Home.searchfreerecipes.com removal process. ^ Eric Saas. Google Educates Publishers To Avoid Bad Ads . MediaPost. News and Conferences for Media, Advertising and Marketing Professionals . ^ Thomas Macaulay . How smartphone apps spy on users by listening to inaudible signals . TechWorld. Latest UK Technology News, Blogs, Reviews, Analysis. ^ Eliminate computer threats . Virusi. Spyware and security news. This entry was posted on 2017-09-27 at 06:30 and is filed under Stealing programs, Viruses. You can quickly scan the QR code with your mobile device and have Home.searchfreerecipes.com virus manual removal instructions right in your pocket. How did you remove Home.searchfreerecipes.com virus?